Monkey Pod (Samanea saman) is easily recognized by its characteristic umbrella-shaped canopy. The tree usually reaches 50–80 ft in height with a canopy diameter wider than its height. 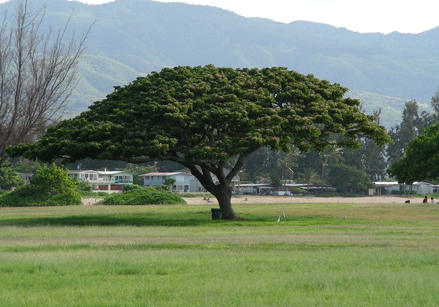 It is common in the Pacific Rim region as a shade tree on small farms, along roads, in parks, and pastures. The tree grows freely almost everywhere it has been introduced and is considered an invasive pest in Vanuatu and Fiji. In many other places it is a useful wood source. In Thailand, Monkey Pod is mainly grown in the Northern provinces along the neighboring mountainous borders providing a bountiful source of larger wood for the carving industry. Harvested correctly the trunk is left in place and larger limbs are cut for use. Eventually the trunk is cut as it passes its best producing cycle. As this tree grows freely a new tree quickly starts growing. There are no lumber yards for this wood. We cut limbs and trees based on our production need. The wood must be rough-cut and carved within several weeks. Otherwise the wood dries out, becomes stringy, and breaks up easily if carved too dry. The wood requires careful drying because of shrinkage and moderate-to-severe warp. Our carvings are made from the Monkey Pod tree. Branches from the tree are generally cut between one to two meters in length and delivered to the carving facility. Branches rejuvenate very fast. Occasionally a tree is cut and used for large one-piece carvings. As the trees grow quickly a new tree soon takes its place. Monkey Pod has greater than 50% Moisture Content (MC) when first cut. Once the larger pieces are brought to the carving facility, the wood is then rough-cut by chain saw into the shape of the product that will be made from this batch of wood. Scrap is used for small carvings and heating homes in the cool season. It takes skill and time to rough-carve a shape like the Twist, leaving enough material for the finish carvers to make consistent shapes. The carving is done while the wood is still wet. The picture shown here is a roughed out Twist made by the chain saw operator. The wood is still very wet and will shrink and crack by a large percentage. This picture shows a roughed out Cube body. The hardest part is carving out the inside. The wood is still wet and the blades of the chain saw can jam easily if care is not used during carving. Finish carvers have generations of experience behind them and work by the "feel" of the wood. Carving is not a full-time job and is generally a family affair involving cousins and close friends. Being an agricultural society, carving can slow down or stop during the rainy season for rice planting and again for harvesting. A skilled carver knows what tool to select based on how the wood feels and what they see as they are working. Tools are generally handmade and every carver has their own set they have created for the work they perform. After hand carving, the rough products are brought to a solar oven where over a period of months they are brought down to below 11% MC (moisture content) as measured with non-invasive and invasive Delmhorst wood lumber meters. At the end of the final drying stage we raise the temperature high enough (80°-90°C or 176°-194°F) to ensure that there are no parasites in the wood. Drying can be difficult as most of our designs have varying wall thickness. The product is sanded to smooth the rough carving into the desired shape. This is all done by hand so every piece is unique, sizes are not exact, and products are not perfectly square. The beauty of the completely unique piece can start to be seen at this time. Now that rough sanding has exposed all of the natural and drying cracks and wood inclusions, these areas are blended and smoothed. The product then goes through final Quality Controls, individually piece-by-piece, to discuss any corrections required with the finish sanders. Once approved oil is applied. Applying the oil is a time-consuming art. The oils are applied in three stages over the course of five to seven work days. No wood sealers or chemical bases are used, so there can be dull and rough spots. This is keeping with the manufacturer's policy of creating an all-natural piece that can complete the product life cycle and be safely disposed of into the earth from which it came. After completion of the product, Livos Oil is applied by hand to seal and protect the wood's surface. The oil contains natural resins that can be buffed to light gloss sheen. Livos is a safe natural oil and is a food safe surface. Livos offers a variety of all natural, non-toxic, biodegradable products. These products are petroleum and chemical-free. Based on renewable raw plant materials that are organically sourced and never tested on animals, Livos products are environmentally responsible, non-polluting, ecologically friendly, and emit no harmful substances. An important component in most of the Livos products is linseed oil. Made from organically grown flax seeds by farmers in northern Germany, it is cold pressed at the Livos factory for use as the main ingredient in oils and other products. Environmentally friendly: products are not only human friendly, they are fully biodegradable and not detrimental to our waterways as many of the synthetic water-based products are. Livos has a range of products that contain zero-to-extremely low amounts of solvents. It is not necessarily how much solvent that is the critical factor, but which type. Livos not only uses plant-based solvents, however, but also synthetic ones such as the isoaliphates. These are also used in the pharmaceutical and food industries and are well established in Europe. 95% of these solvents decapitate in the first hour of application. Once dried, there is no further “off gassing,” as occurs with many synthetic products. It positively influences the indoor air quality, and does not contribute to harmful ozone-depleting emissions. There is no detrimental effect on one's health from the Livos products: from manufacturing, application, the occupier, to disposal.